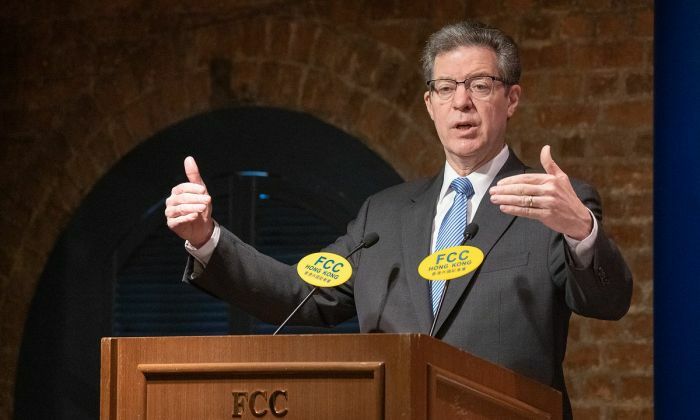 While visiting Hong Kong, U.S. ambassador for religious freedom Sam Brownback delivered a speech at the Foreign Correspondents’ Club calling on Beijing to end all forms of religious persecution in China. “Chinese government is at war with faith. It is a war they will not win,” Brownback said on March 8. He told the audience that people in China are not allowed to go to church, worship their gods, buy a Bible, nor name their children with religious-style names, risking detention in internment camps or prison. “Since 1999, the United States has designated China as a country of particular concern under the International Religious Freedom Act of 1998,” Sam Brownback added, referring to an annual assessment of religious freedom conducted by the U.S. Commission on International Religious Freedom. China is continually ranked as “of particular concern,” which is the most serious category for violators of religious freedom. Persecuted faiths include Catholics, Muslims, Tibetans, and practitioners of the banned spiritual group Falun Gong. Brownback especially highlighted the plight of Falun Gong adherents, who continue to be arrested, tortured, and killed for their beliefs. “The Chinese government detained and reportedly tortured Falun Gong practitioners with credible estimates putting the number of Falun Gong practitioners in prison in the thousands,” Brownback said. Citing estimates by Falun Gong, Brownback noted that in 2018 alone, at least 69 Falun Gong practitioners died in Chinese custody or due to injuries sustained while in custody. Falun Gong was introduced to the public in 1992 by Li Hongzhi. Based on the moral principles of truthfulness, compassion, and forbearance, the traditional Chinese spiritual discipline incorporates Buddhist and Daoist teachings and includes slow, meditative exercises. Spreading by word of mouth, the practice counted more than 100 million adherents by the spring of 1999, according to official estimates. Fearing that the popularity would threaten the Chinese Communist Party’s rule, then-Party leader Jiang Zemin launched a nationwide persecution in July 1999. Since then, hundreds of thousands are estimated to have been arrested and detained within prisons, labor camps, brainwashing centers, and other detention facilities. In recent years, allegations have emerged that the Chinese regime oversees an organ transplant industry whereby organs are forcibly harvested from prisoners of conscience, including Falun Gong practitioners and Uyghur ethnic minorities, most of whom practice Islam. Brownback promised to push Beijing to end the abuse and mistreatment of Falun Gong practitioners. He believes that one day, Chinese people will gain the freedom of faith. Sam Brownback, 62, is an American attorney, politician, and diplomat. He was governor of Kansas from 2011 to 2018, and a U.S. senator from 1996 to 2011. In February 2018, Brownback was named the U.S. Ambassador-at-Large for International Religious Freedom. In that role, he heads the Office of International Religious Freedom in the U.S. Department of State, and is the highest-ranking U.S. diplomat on international religious freedom dedicated to bring greater religious freedom to the world. Brownback visited Abu Dhabi, capital of the United Arab Emirates, before his trip to Hong Kong. He said he would like to visit an internment camp in Xinjiang, the northwestern region of China where authorities have detained up to a million Uyghur and other Muslim minority groups. Survivors of the camps describe torture methods and political indoctrination in an attempt to force them into giving up their faith.